From the moment you arrive at the Penguin Theatre in historic Stony Point, you can tell that you are in for a completely unique experience. The theater is small and quaint, but the energy inside is undeniable and full of eager patrons ready to see a play. This energy may also be increased since 2017 marks the 40th anniversary of Penguin Rep Theatre. “Trayf,” by Lindsay Joelle and directed by Benjamin Kamine, is the first play of the 40th anniversary season. The play premiered to a full house and did not disappoint. 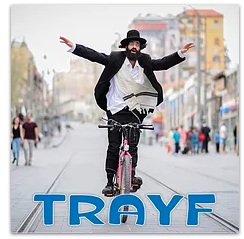 “Trayf,” which is Yiddish for forbidden, is the story of an Orthodox man named Zalmy (Jason Liebman) who is struggling with his religious identity and the separation he feels from the rest of the world. His doubts are caused mainly by ‘secular’ music such as rock ‘n’ roll, and ‘secular’ activities like roller skating. Zalmy spends his days traveling in a ‘Mitzvah Tank’ with his best friend Shmuel (Brendan Titley) as they take to the streets, attempting to convert people to Judaism. These travels show the close friendship these men have, but they have differing views on their religion. Shmuel is more rigid in his beliefs while Zalmy is more worldly and open-minded. Their rides are filled with talks of love and all that comes with it; the humorous banter garnered many laughs from the audience. In the quest to look for converts, the men encounter Jonathan (Craig De Lorenzo), a man with no Jewish ancestry looking to convert to Judaism and his non-practicing Jewish girlfriend Leah (Liba Vaynberg), which sparks theistic debates between the two friends. The character dynamics and themes of the play create such interesting conversations between the protagonists and you feel that you are seeing something special and vital. The discussions are often comedic but some are a bit more serious and seem almost raw, drawing the attention of the whole room. Another unique piece of the play is the set, which is the ‘Mitzvah Van’ itself. The set design of “Trayf” provides a feeling of closeness with the characters by having the set be the van that Zalmy spends most of his time in. The amazing set is courtesy of Brian Prather whose scenic design tied the piece together. Other technical elements vital to the production of “Trayf,” include the sound provided by William Neal, the lighting by Christina Watanabe and the costumes provided by Lux Haac. All of the elements worked in tandem to create a memorable piece of theatre that everyone could enjoy and experience something amazing. This is the perfect play to see on a night out in Stony Point. “Trayf” is showing at Penguin Rep until June 11, with show times and tickets available for purchase at www.penguinrep.org. Penguin Rep Theatre is located on 7 Crickettown Road in Stony Point.